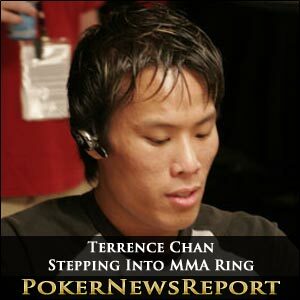 Canadian poker pro Terrence Chan has announced that he will step into an MMA (mixed martial arts) octagon ring at the end of this month when the Legend Fighting Championship 8 event takes place during the AsiaWorld-Expo in Hong Kong. The 31-year-old will take on 29-year-old Hong Kong native Alex Lee on March 30 in the Chinese city-state after taking to his blog, to write that his opponent is “bigger, stronger, taller (by about 5 inches! ), more experienced and who, being HK born-and-bred, will likely be the crowd favourite too”. It should be noted that this bout is not in any way similar to the Bertrand ‘ElkY’ Grospellier versus Lex Veldhuis match-up that took place at Marbella’s Marcelena bullfighting arena in November last year as the good friends – who are both Team PokerStars Pros – were not stepping into the ring to face a professional fighter. The Dutchman won that fight, by the way, when the Frenchman was unable to get off the canvas after being kicked in the head twice during round two of the bout. Chan, meanwhile, only found out about his possible fight last Friday when he “got a text message out of the blue” from Legend Fighting Championships co-founder Mike Haskamp in which he asked the poker pro if he “was interested in taking a fight on two weeks’ notice here in Hong Kong”, to which he responded with a “hell, yes, I am interested”. Well, it appears certain that the pro will receive several blows to the face as he will be “fighting under the full professional, Unified Rules of Mixed Martial Arts”, which means “both elbows and knees are allowed on the ground”. Chan rightly concluded by pointing out that “this is no joke” as he will be “playing in the big leagues now, kids”. The Vancouver-based player – who is experienced in Muay Thai and Brazilian Jiujitsu – did get one detail wrong about his upcoming fight, however, as Lee is just three inches taller than him at 5ft 10ins. Did I say ‘just’? Well, I’m not the one stepping into the ring, so I can be cavalier when discussing this fight. Still, while obviously confident in his abilities, Chan did admit that “two weeks’ notice is obviously not an ideal situation”, although he added that, “since I’m coming off a fight in which I took no damage, it’s perfectly fine (as) I’m healthy and in shape”. If you want to see the fight – and can’t make it to Hong Kong – don’t despair as you can watch it live on YouTube at 11:00 GMT (Greenwich Mean Time)/07:00 ET (Eastern Time Zone) next Friday.